​​Combining my halogen-bearing experimental results with analysis of Martian apatites, amphiboles, bulk compositions, and the recent discovery of Cl-Scapolite in a Martian meteorite, my work has shown that the parental magmas to the SNC meteorites significantly more chlorine and less water than their terrestrial counterparts. Eruption of these chlorine-rich, water-poor basalts contributed to the acidity and salinity of Mars’ surface, and any potential biologic activity would have to survive in these high temperatures and saline fluids. 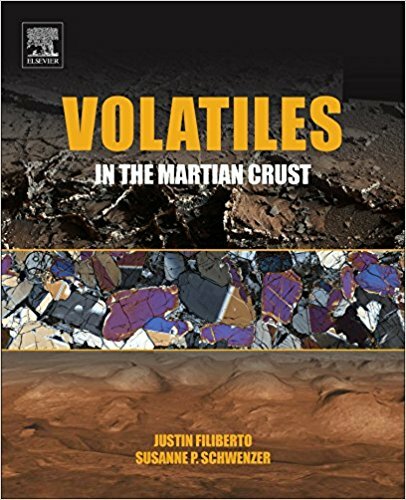 Building on this, Filiberto and Schwenzer (2018) recently published our book about Volatiles in the Martian Crust. My recent work has focused on understanding the mantle potential temperature and cooling history of Mars and the similarities and differences with the Earth. This work has shown that an average mantle potential temperature of 1450±80 °C may represent a global average for the martian mantle during the Noachian (ancient Mars). 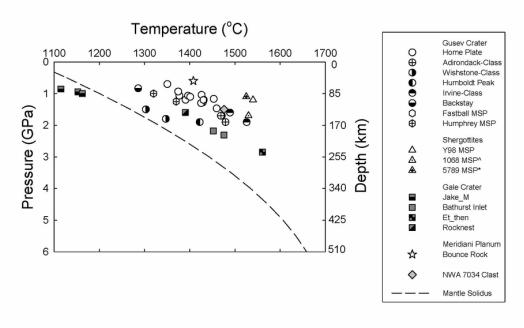 If we compare this estimate of ancient martian mantle potential temperature with the terrestrial mantle potential temperatures based on Archean komatiites, this suggests that the martian mantle was actually significantly colder than the terrestrial mantle. See Filiberto (2017) Chemical Geology review paper. Magmatism is one of the most important geologic processes in the history of Earth and Mars, and one of the few to provide major changes and energy influx to the Martian surface and subsurface past the Noachian. Eruption and degassing of mafic magmas contribute to the surface volatile species, as well as nutrients and energy that are needed for biologic processes. Our research investigates fluid-rock interactions of igneous fluids and sulfur rich sediments in terrestrial rocks on the Colorado Plateau to understand whether microbial life is surviving in metamorphic aureoles, despite dramatic temperature and chemical changes. ​My recent work on Venus, focuses on reinterpreting data from Russian lander missions and developing models for potential future missions to Venus. The Russian Venera and Vega missions landed on the surface of Venus during the 1960’s, 70’s and 80’s, sending back geochemical data from the surface. The data that was returned are not as precise as we can do with modern technology, such as the analyses from the MER and MSL missions to Mars. Therefore, my work focused on using experiments results on terrestrial basalts to classify the rocks analyzed on the surface of Venus and to determine what conditions (pressure, temperature, and water content) were needed to produce these rocks. Building on this work, we have a funded NASA SSW grant to investigate the alteration minerals that will form on Venus lava flows. See Filiberto et al. (2019) LPSC abstract for more information about our ongoing work.